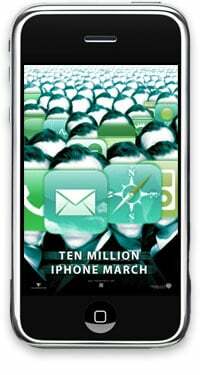 Updated: 10 Million iPhones in 2008! 7 Million in last 3 Months! Apple Q4 Results! Apple is reporting their Q4, 2008 financial results, and while things look good for the Mac, they look great for the iPhone, with 6,892,000 units sold during the 3 month period, up from 1,119,000 in the same quarter last year. And YES! Apple has already made their 10 million iPhone in 2008 goal, with the holiday season still to come. This makes Apple, dollar-for-dollar, the third largest mobile phone manufacturer in the world (after Nokia and Samsung), and Apple has only been in the space since June 2007! Mac's hit 2.6 million, iPod's at 11 million (not breakout for iPod Touch, as usual). Conference call is currently underway (and Steve's on the call!). When asked why Apple only had 1 iPhone SKU, Steve replied (paraphrased), Babe Ruth only had 1 home run... he just kept hitting it. On the same topic, Steve said that while other companies made dozens of different voice units, he believes software was becoming the differentiating factor, and that presenting developers with multiple device versions wasn't compelling. He also said Apple's competition didn't come from software backgrounds like Apple did. When asked if RIM having around 50% upgrades vs. new users, if the iPhone had a greater number of new users, did that make Apple's true success against RIM higher, Steve maintained he was happy just to beat RIM on the direct numbers. No direct US vs. International split for iPhone sales were given.